On Sunday evening, Texas Governor Greg Abbott appeared live on Facebook where he enthusiastically signed a bill banning sanctuary cities in his state. The first-term Republican governor, who scribbled his signature with flourish, did not provide the public with any advance notice regarding this signing. 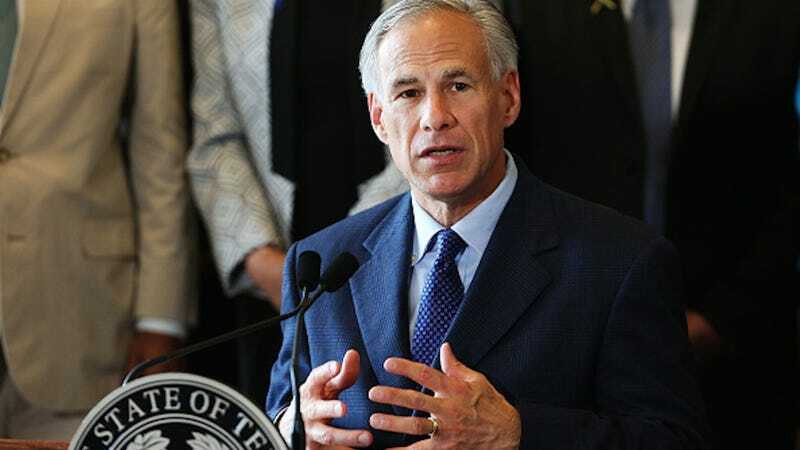 Abbott’s office went live at roughly 8 p.m., at which point the governor spoke for five minutes about the responsibility of lawmakers to “keep us safe.” He leaned heavily upon the tragic death of Kate Steinle, as evidence for the ban’s necessity. In 2015, Steinle was allegedly killed by undocumented immigrant Juan Francisco Lopez-Sanchez in San Francisco—another sanctuary city. Now politicians like Abbott are exploiting her death in order to portray undocumented immigrants as uniformly dangerous. After his appeal, Abbott uncapped his pen, brandished it before the camera, and signed the bill. “Texas has now banned sanctuary cities in the Lone Star State,” he declared proudly. As the Associate Press reports, this legislation enables police officers across Texas to demand the immigration status of anyone they detain, whether for a small traffic infraction or a significant crime. Texas’s Legislature, currently dominated by Republicans, refers to the bill as a “show-me-your-papers” expedient. And now that it has become law, sheriffs must comply with U.S. Immigration and Customs Enforcement (ICE) or else face jail as a penalty. Among other things, this means detaining criminal suspects at ICE’s request so that they can be deported. Every major police chief across the state opposes the sanctuary city ban, as do the Democrats in the Texas Legislature. At the federal level, courts have obstructed Donald Trump’s efforts to defund sanctuary cities. Abbott, however, argued that Texas is only replicating measures that have “been tested” federally. He does not acknowledge the vehement protests against them, nor the ongoing efforts to prevent their implementation. Instead, he doubles down on the pernicious, but all too effective myth that undocumented immigrants are brutal criminals.